Hamdard University Karachi the largest private sector University of Pakistan being founded by Shaheed e Pakistan Hakim Mohammad Said Shaheed. The University is located about 10 KM from the main metropolis, located at the border of Sindh and Baluchistan. The university has seven faculties including Faculty of Eastern Medicine, Faculty of Engineering Sciences & Technology, Faculty of Health & Medical Sciences, Faculty of Social Sciences & Humanities, Faculty of Legal Studies, Faculty of Management Sciences and Faculty of Pharmacy. The university is proud to have more than 500 highly educated faculty members and 5000 plus students enrolled in different programs at main campus and city campuses. Madam Sadia Rashid, the worthy Chancellor of university is the daughter of Hakim Mohammad Said who has been taking care of the institution after the demise of Hakim Sahib. 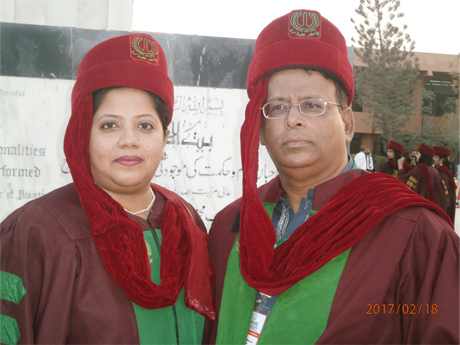 The 21st Convocation of Hamdard University was held on February 18, 2017 at the main campus. 1450 graduates and post graduates were awarded degrees in different disciplines. Honorable ToshikazoIs Himora, Counsel General of Japan at Karachi was the guest of honor who distributed the degrees with the Chancellor, Vice Chancellor and other dignitaries of Hamdard. The event started with the entry of procession in the Al-Moeed Auditorium followed by the formal speeches and later the degrees were distributed. At the end of the programme all the staff, students and their parents were served dinner in open area in green lawns of the university. Dr. Ata Ur Rehman and Dr. Kiran Ata Ur Rehman are the elder daughter and son in law of Engr. Iqbal Ahmed Khan, VP of Saudi Aramco Ex-Employees Association (SAEEA). Both are medical doctors and are engaged in teaching at Hamdard College of Medicine & Dentistry, Hamdard University Karachi. Dr. Ata has recently completed his Master of Philosophy (M.Phil.) degree in the field of Pharmacology from Faculty of Pharmacy, Hamdard University in Karachi. His topic of research was “Herbal treatments for acute renal failure”. 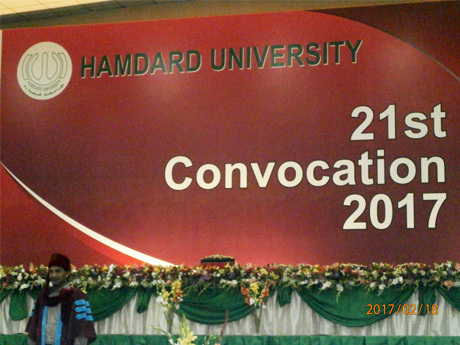 The degree was awarded at 21st Convocation of Hamdard University, Karachi. He is planning to pursue his doctorate in the same field while carrying on similar researches on herbal remedies. Dr Ata Ur Rehman is happily married to Dr. Kiran A. Rehman who is a medical educationist, they both having three children Obaid, Habib, and Mariam. SAEEA wish them a bright future and best of luck for their future endeavourers.